Former President Olusegun Obasanjo recently stated that the National Assembly is filled with rogues and thieves, and that President Buhari should be wary of them. His comments quickly elicited reactions from members of both legislative chambers, with many lawmakers chiding the former President for uttering such. But in the light of recent happenings in the national political space, one wouldn't be wrong in agreeing to a large extent, with OBJ's statement. While Nigerians still await the showdown over the issue of forgery in the upper legislative chamber, the green chamber has also found itself in quite a bit of a quagmire. Abdulmumin Jibrin was removed from his position as Chairman of the House Committee on Appropriation, by House Speaker Yakubu Dogara. Jibrin was accused of abuse of office, misconduct and incompetence. But in a swift reaction, Jibrin then made some damning allegations against Speaker Dogara and three other principal officers of the House- Deputy Speaker Yusuff Lasun, Chief Whip Al-Hassan Ado-Doguwa, and Minority Leader Leo Ogor. Jibrin accused the four men of requesting for the inclusion of about N40bn projects into the 2016 budget; claiming that his refusal to grant this request was what led to his removal as Committee Chairman. In the same vein, he also accused the four men of �short-changing the House by removing N40bn out of the N100bn allocated for constituency projects, to share amongst themselves. 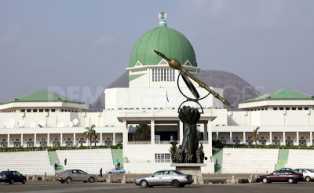 Ten Committee Chairmen were also accused by Jibrin, of inserting over 2,000 projects worth N284bn into the budget. In all, the 2016 budget is said to have been padded to the tune of over N400bn! We also heard that the Speaker (allegedly) diverted a Federal Water Project to his personal farm in Nassarawa. As accusations and counter-accusations rang out amongst House members, it became more understandable why President Buhari was so visibly perplexed that a budget he had submitted to so-called Honorable members for approval, had been astronomically jacked up , and insanely retouched, for certain selfish purposes. Senate Majority Leader, Mohammed Ndume, has insinuated that it is an anomaly for Nigerians to use the term, padding�, as lawmakers are supposedly allowed by law, to adjust the budget. Abdulrazak Namdas, Chairman of the House Committee on Information, agrees with him. In fact, the House Speaker himself who stands accused has recently stated that lawmakers cannot be tried for carrying out their lawful duties, this was in reference to the issue of adjusting the national budget. A Doctor of Law, Tunji Abayomi, however, disagrees. In Abayomi's opinion, while Section 59 of the constitution confers on lawmakers, final say on the budget, the process of budget-making in itself, is an EXECUTIVE FUNCTION, and is the only subject in the constitution with a specified modus. Thus, in his submission, contrary to the constituency projects argument being so readily employed by lawmakers now, the National Assembly can approve the budget, but has no power whatsoever to insert any project into it. The esteemed Professor's case is still in court. Despite all the economic hardships being currently experienced in the country, none cannot deny the fact that the political landscape seems to be proceeding on a somewhat new and unfamiliar trajectory. All of a sudden, legislators are finding out that it is no longer business as usual. People are being questioned for their actions; and in a bid to not go down alone, politicians are sparing none- not even former allies. This is good! Jibrin recently stated on Channels TV, that Obasanjo's assertion that NASS was riddled with rogues and thieves, was not completely wrong we concur. But while he's at it, Jibrin himself cannot be absolved of all acts of misconduct, even as he claims to be completely incorrupt. There are important questions to be asked; like why he only chose to speak out when he was sacked as Committee Chairman, and if there is any truth to recent allegations raised against him by some aggrieved youths, that he (Jibrin) used his position to loot N418m through fake contracts, from the National Refugee Commission. What about the money laundering allegations which have now forced him to seek a court order against arrest by the Police? As the mud-slinging continues, Dogara has now been dragged before the EFCC, the ICPC, and the Police, by the former Appropriation Committee Chairman. We await the outcome of investigations into the issue for Nigeria's sake, the APC cannot treat this as a family affair, we must get to the root of this matter. In an era of change, all things hidden come to light. In an era of change, it is pertinent that weeds be separated from the good grain. A few good heads may roll in an era of change- casualties of the war- but the purge becomes necessary to identify the real rogues and thieves� that are hell-bent on crippling this nation, just to satisfy their wicked cravings!